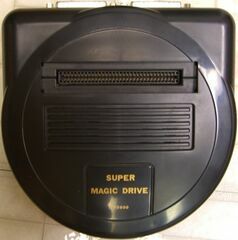 The Super Magic Drive, manufactured by Front Far East, is a copier that dumps game cartridge info to four different types of floppy disks or to a PC directly via a parallel port. These files come in SMD format, which in turn can be used on an emulator. In addition, putting different floppy disks in the Super Magic Drive allows them to be playable on the Sega Mega Drive. It also has features for supporting battery-backed RAM present in some game cartridges, as well as providing functions for disk management. With an adapter, the Super Magic Drive can copy and play SNES games too. Another allows PC Engine games to be copied, but the games have to be loaded from the external disk drive every time instead of being able to play them from the memory. In addition, the Super Magic Drive serves as a Japanese/North American/European ROM converter. 8 Megabits RAM (1MEG) onboard (expandable to 16Mbit) From simple research online, you can find that some units are 24MBit. It has also been said that FFe at one stage even offered a service to upgrade SMDs to 32MBit. When formatted to 1.6 Meg, one can have three games per disk (4Mbit each) or TWO games (one 8Mbit game and one 4Mbit game) or even six 2Mbit games. If your SMD did not come with the floppy drive (LocalH's didn't), you can make use of the COM I/O port by purchasing a standard 25-pin male-to-male parallel cable. A printer cable with a 36-pin Centronics port will not work. Also, you will have to make sure your parallel port is set to either EPP or ECP/EPP. Super Magic Drive, sitting in a European Mega Drive.